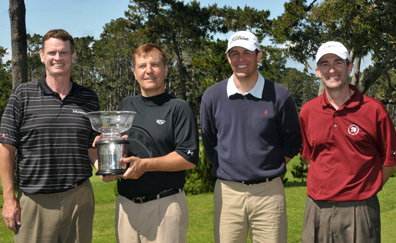 In dramatic fashion the duo of Donovan/Haag (your blog author) won the 44th annual Four Ball (best ball) championship. In much tougher conditions our patience paid off as we battled win, rain, and tougher pin placements. After turning the front nine in even par we felt a -4 back nine would put is back in the hunt. After a birdie on 11 and two shots inside 6 feet on #12, I felt we were right back in the event. However again for the second time we BOTH missed our short birdie putts. Although I felt this was probably it for us, we continued to focus on the final 6 holes. With the wind gusting we both knew that 13-18 would play tough and even a -2 finish may give us a shot. After a close call miss on the par 5 14th hole, I fired a 54 degree sand wedge to 8 feet on #15 the short downhill par three. Darryl followed with a shot that ended 20 feet below the hole. Again I felt if we could get one of them to drop, we’d be back in the hunt. Darryl rolled a beauty into the center of the hole and now it was “game on”! #16 from the very back of the tee box was probably playing 500+ yards, knowing that cutting the corner was a long shot I decided to take my tee shot done the center of the fairway. This proved to be a very wise decision as Darryl missed his drive in the right trees. As #16 was our lone bogey in the tournament the day before, I did NOT want to give up a shot on this hole again. I had 205 to the hole with a strong wind into my face, and decided to hit my trusty 22 degree rescue club (Taylor Made of course) after perhaps my best swing of the day I looked up to see the ball soaring towards the pin. The ball landed on the front fringe 25 feet from the hole, after 2 putts we had secured the ever important par on this very tough hole. #17 was another thriller, after I hit a perfect 3 wood into the wind Darryl pulled his tee shot into the left bunker. He then struck a perfect wedge shot that ended 4 feet from the hole. Darryl candidly had struggled with these short putts, but in this situation he was absolute NAILS- he drained the 4 footer, and followed it up on #18 with a 10 foot par putt that went in dead center for what appeared to be the winning putt! NOT SO FAST, as we hear a cheer from the 18th green, Russell had drained a 15 foot birdie putt to put us into a playoff for the championship. The AMAZING thing is Russell Humphrey had just witnessed the birth of his son in Lodi at 1:30 am and then drove back down to Pebble Beach for the final round. After a complete sleepless night it was an awesome putt to make on the last hole to draw even. I’ve had the pleasure of playing with both these fine gentlemen before, and I knew we’d have to play well against them to have a chance. After both teams made par on 10 we moved over to the 9th hole, where both Darryl and I hit great shots into this very tough par 4 hole. Russell and Jim hit their shots left and had difficult up and in attempts. After a great chip to 4 feet by Russell, Darryl from slightly over the green chipped in from about 35 feet to secure this Championship for us over 50 guys (oldest winning team ever). THIS was a thrilling victory, one we really never expected to win. But we did hang in the game and had some things go our way down the stretch. My partner Darryl Donovan showed why he is a champion and a winner. I’ve seen a lot of players over the years quit when it seems hopeless with the putter, not Darryl, he never complained, cried, yelled or got down on himself. I think during yesterdays round I must have seen him change his putting grip 3-4 times…but in the end his putts and chip-in won the event for us, and I couldn’t be prouder of the way he handled himself. Tomorrow we both tee it again in the US OPEN local qualifier at Bayonet (I tee off at 8:33 and Darryl at 9:09) and hopefully we both can keep it going for one more day. I’ll have results of the local open qualifier and pictures of Spyglass Hill tomorrow after my round. Till then, thanks for staying tuned!! 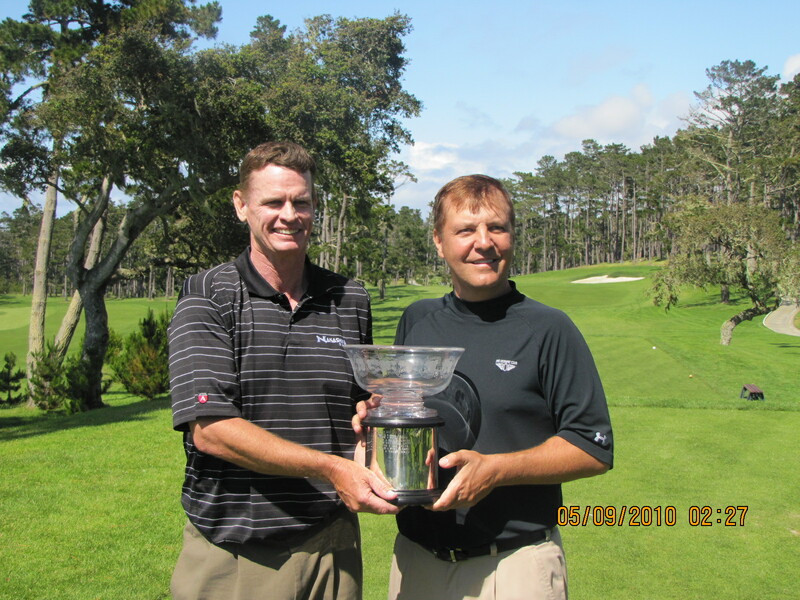 PEBBLE BEACH – Little did Randy Haag and Darryl Donovan know that when they first met at the ‘84 U.S. Amateur that their friendship would yield a dynamic four-ball partnership. 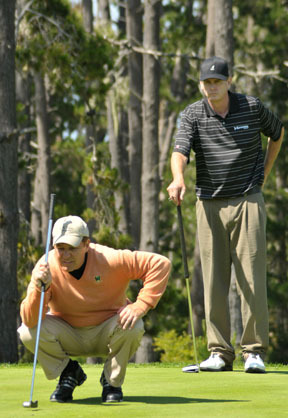 After claiming the NCGA Four-Ball Championship at Spyglass Hill in a two-hole playoff, their second such title (the first coming in 2000), the duo has now won more than 10 four-ball titles. The champions had started the final round four strokes off the lead established by Spring Hills’ Jack Hoenes and Gary Yoro. “We knew that if you were in striking range, with the conditions tougher today, that it would bring guys back to the field.” Indeed the benign weather that greeted competitors the first two rounds was absent Sunday, and when Hoenes and Yoro made the turn at four over for the round, it was anyone’s ball game. A Haag birdie at the 11th, a Donovan 20-footer on 15 and a birdie from out of a bunker by Donovan on 17 proved the difference, breaking a logjam of five groups at 11 under for the event. “That birdie on 17 was huge,” said Haag. 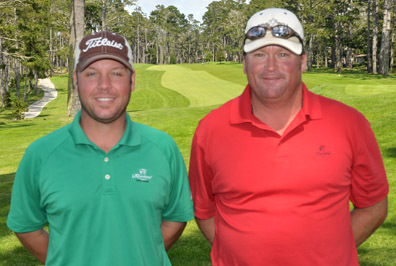 The fifth duo at 11 under turned out to be the last group to finish – Russell Humphrey of Woodbridge and James Watt of Lockeford Springs. It’s difficult to imagine a more memorable tournament for the 38-year-old Humphrey, as he traveled back to Lodi last evening to be with his wife as she gave birth at 1:30 a.m. last night, then returning to Spyglass this morning. On no sleep, Humphrey looked at a downhill 15-footer for birdie on the final hole to get his team into the playoff and jarred it. But it was Donovan’s short game, which heated up on the final nine of regulation – the CordeValle member made a nine-footer to save par on the 18th hole – that proved the difference. After pars on the first playoff hole, the 50-year-old Donovan chipped in for birdie on the second hole, Spyglass’ tough 9th. Back-to-back defending champions Taylor Travis and Ryan Sloane did not relinquish their title gently, at one point fighting to 12-under for the tournament and a tie for the lead, but the duo ended at 11-under and in a three-way tie for third with the Danny Paniccia/Mike Stieler and Jeff Hamm/Stephen Hale duos. Nice going Randy. 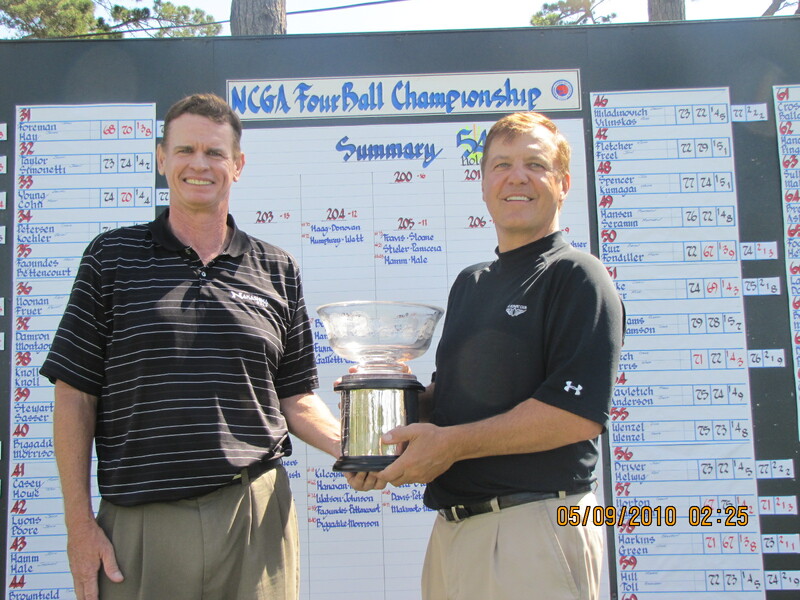 You and Darryl are headed for a record number of NCGA Tournament victories if you aren’t already there already. Very cool dad! Wow you actually are doing technical things I wouldn’t have expected from you… like having your own website… and a facebook! Good job on the win you had!